Publix Super Markets finished 2016 better than most with net sales +5.1% and comp sales +1.9% while continuing its march northward, opening 22 stores in total and acquiring a foothold in Virginia with the purchase of 10 Martin’s locations. One move that has received considerable attention in recent weeks is the announcement that the company will build its fourth store under the organic-focused Greenwise banner – and its first in almost ten years. With Whole Foods struggling due to the spread of often-less-expensive organic into mainstream outlets, many have wondered why Publix chose 2018 to get back into the space. We say, “Why not?” Located in a heavily trafficked neighborhood adjacent to the Florida State University, the location should have no problem meeting sales expectations. 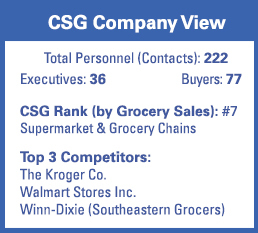 More importantly, having a second banner (tweaked after a decade of consumer feedback) provides the company with options as it expands throughout the Southeast – options when a market calls for a smaller footprint than a standard Publix affords and options when market demographics (like college campuses or higher-than-average household incomes) point to support for a more organic focused approach.